But things weren’t always celebratory for Marcellus. He had been chronically homeless for six years. “Family will only help you for about so much. 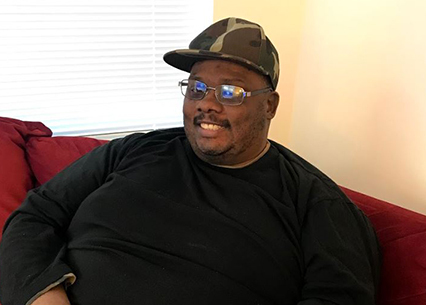 I was homeless, I didn’t have a job and a lot of stuff was happening all at once.” It was hard for Marcellus not having a stable home, and when he was diagnosed with lupus, life didn’t get much better. Marcellus tried his best to live on the streets with lupus, but eventually, it became too much to manage. “I signed myself up for a mental health program. I was stressed out, homeless, and things weren’t going my way. I needed help and someone to talk to.” Soon after, Marcellus was introduced to Community of Hope. That’s when things really started to change for the better. Marcellus admits that, since he hasn’t always made the right life choices, he now works hard to mentor young men - encouraging them to stay in school and out of trouble. “I tell this generation behind us how important education is. Don’t hang with the wrong people. Don’t do what I’ve done and waste time. I wasted a lot of my years.” Now with a positive outlook on life, Marcellus spends time cooking, and actively participates in a movie club he started with a group of friends. Things are falling in place for Marcellus and he is HOPEful that they only get better.